Need a better mattress for your back that provides perfect support while delivering firmness that's not too hard and not too soft? This incredible latex mattress core was created specifically for the restoration and recovery of fatigued muscles with contoured alignment for perfect posture and lumbar support, as well as delivering energy back to your body while you sleep. The Pure Performance Core mattress has no added comfort layers so if you tend to like the feel of a medium FIRM, choose this. Our 5-Zone Pure Performance latex mattress core is made from pure, creamy white natural latex rubber ergonomically designed to last decades and provide the support your body needs and craves. We also have GOLS-Certified ORGANIC LATEX. 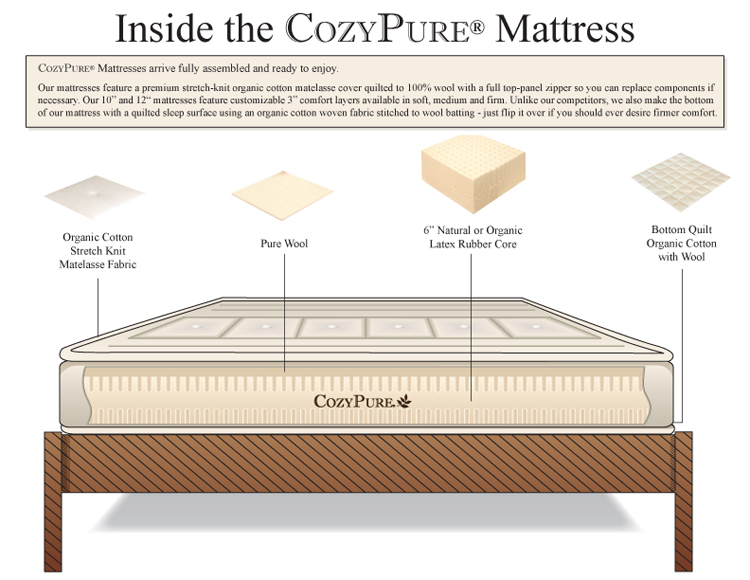 To provide the most supportive sleep surface, the Cozy CORE does not have any added layers. Under the organic cotton and wool quilting is the latex core, putting your body in direct contact with the 5-zones, which will offer you a firm mattress for decades. #1 - Add a layer of 1.5" soft scultped latex and turn it into our CUSH mattress. #2 - Still want it softer? You can add another 1.5" soft layer (for a total of two soft layers). #3 - For folks that want some plush luxury, consider adding our Natural Latex LaNoodle Cuddle Top. #4 - You can also combine the above -- add one or two layers of 1.5" latex PLUS add the Cuddle Top (this will give you the softest configuation possible for this firmer mattress). #5 - If you should ever desire the Cozy CORE to actually be a little firmer, simply flip it over (the quilting is tighter and firmer on the bottom).